We're finally heading to the Great Smokey Mountains for out "honeymoon". We'll be missing the 7-10 Split Bowling Event this evening in Naples (Sorry Gomer and Kara). That is if Hurricane Gustav doesn't alter plans. We'll get a 7-10 split of our own as that hurricane passes by and Tropical Storm Hannah lingers to the east. We'll squeeze up I-75 between the two storms and hope that all remains well back at home. On our way north, we hope to stop at Ziggy's - an animal sanctuary in Lake City, FL where 4 of our monkeys from the former Florida Monkey Sanctuary now reside. 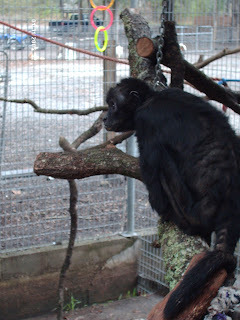 Most noteable is Gertie - a 26 year old spider monkey who was raised by my parents and is like a long lost sister to me. There may be tears. 100% chance if she remembers me. Gertie is seen above - swaddled in the pink and white crocheted blanket - playing the role of the baby Jesus. (circa 1983?) Gertie was brought to a new sanctuary in 2008 after suffering was a skin problem (seen below) at her home in North Carolina. I'm told she's doing much better. Then its up to Tennessee for a few days of hiking, waterfalls, train rides and cave exploration. I hope everyone stays safe in the storms. Every Labor Day weekend, photographer Clyde Butcher invites several hundred people to his home and offers walks around his backyard. He lives in the Everglades, and his yard is under water. The walks are called "Muck-Abouts" and you must sign a waiver. I saw the words alligator, snakes, dehydration, lightning. I didn't read it but I'm sure it was exciting. 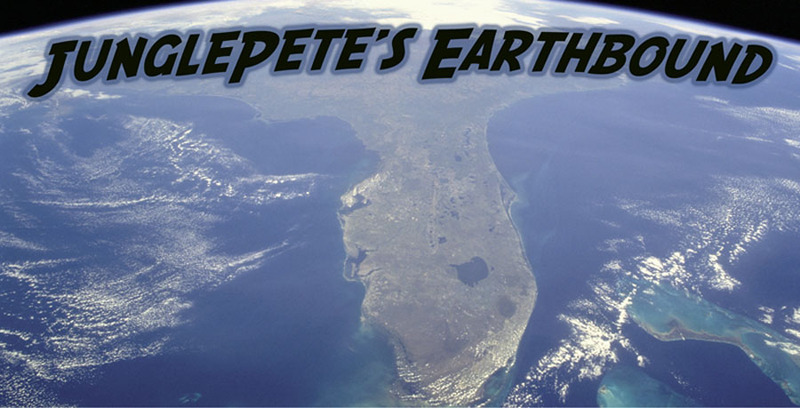 Clyde is the eyes of the Everglades. Some call him (myself included), the Ansel Adams of our generation. If you've ever seen his photography, which is black and white and painstakingly shot with old school equipment you'll get a sense of the grandeur and nuance of the sawgrass prairies and cypress forests that make up the 'glades. MaLe and I were slated for the 9:30 am photographer's walk which would lead us through the knee-high muck of the cypress sloughs where bromiliads (a type of epiphyte or airplant) cling to tree trunks. A few thunder grumbles from the advancing Hurricane Gustave made us a bit nervous, but it was relatively cool morning and a nice day to tromp through the swamp. Nowhere near as exciting as a hike through the Fakahatchee Strand State Park with Mike - but it was fun to get MaLe to shake her fears and get into the water. I rarely buy into the hype. I'm not one to succumb to mania or participate in a frenzy but when my home is projected to be within the HurriCone I can't help but freak out a little bit. First of all I would trademark "HurriCone" but apparently its some type of floor drying equipment. "Floor soaking wet from the latest storm? You need a HurriCone!" 2nd of all - I'm in the freaking cone for Tropical Storm Gustav. My boss says don't worry as he packs his travel bags to head to the Dominican Republic. My dad says not to worry as I need to pack my bags to head to the Great Smokey Mountains for our honeymoon. Mine and Ma-Le's. Not Mine and my fathers. The cone essentially represents the area that a hurricane has the potential of hitting. It's the probability that suggests if God drops his ice cream - will it land on you? Fay has passed by and here comes Gustav. It quickly went from Tropical Wave to Tropical Depression to Tropical Storm and Hurricane within 24 hours before weakening over the mountains of Haiti. But forecasters say it will head through the Gulf of Mexico and as of right now (Wednesday 8/27) the storm is forecasted to head towards New Orleans by Sunday. It could go any which way regardless of the cone. I know that. But Tennessee doesn't get hurricanes. Right? Hurricane names are like Senators. If the hurricane doesn't make much of a commotion they get to come back every six years. But do something disastrous and they get retired, leaving us to talk for years to come about the damage they've done and the billions they have cost us. Hurricane Arlene is the Daniel Inouye (D-HI 1963-Present) of storm names. Every 6 years she has a chance to wreak some havoc but she never seems to cause much trouble. She first appeared in 1959 as a tropical storm and returned as a hurricane in 1963, 1967 and as a tropical storm again in 1971. She took a decade off before welling up again in 1981. In 1979, a list of 21 names went into circulation, followed in the next 5 years by 5 distinct sets of names which would rotate from year to year. So Arlene returned again in 1987, 1993, 1999 and again in 2005. Being the first of the storms named and often early in the season, she rarely has a chance to be anything special but she's tried 9 times. Initially storms were only given names if they were horribly destructive like the Great Galveston Hurricane of 1900 and the Great Miami Hurricane in 1926. From 1950-1952 storms were named based on the army alphabet - Able, Baker, Charlie, etc. In 1953, The National Hurricane Center began using women's names. The feminine touch softened the blow of having your community razed and flooded by an act of God. 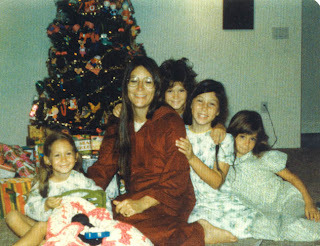 Names were reflective of the times - Gilda, Hazel, Mabel, Norma, Roxie, Edith, Flora. The didn't push it and Harriet never made the list. They went so far as to schedule the X, Y and Z. Although they were never used, if they needed to, no one would have forgotten Hurricane Xmay, Yurith or Zorna. A four year rotation of women's names was used from 1960-1978. And the 6 year cycle began in 1979 and included men's names. The World Meteorological Organization allows for the retirement of storm names if they are particularly deadly, costly or silly sounding. The country affected can request the retirement and the name is stricken from the rotation if the WMO deems it worthy. Hazel was the first of the naughty storms and she was retired in 1954, followed by 39 other storms. The last being Noel in 2007 who ironically hit the North Pole. The only exception to the rule was when Fern was dropped and replaced by Frieda for no particular reason. Possibly because Fern is a type of plant. Significant of nothing, I once had a hamster named Fern. Senators are retired in a similar fashion. Do bad things and your retirement will be arranged for you. Affairs, financial scandals and "pooping" in airport bathrooms are the equivalent of flooding, 150 mph winds and hitting Greenland. But if the worst thing you've ever done is rain in the middle of the Atlantic or filibuster a Republican majority you'll be hangin' 10 year after year on the Subcommittee on Energy and Water Development. Although "only" a tropical storm, Fay has proven to be the Larry Craig of storms, causing persistent trouble and won't seem to go away. I need to keep my mouth shut. 500 tours and I have never had one as wet as today's. It was my first Everglades tour since Fay headed North and with a forecast of partly cloudy (a departure from the usual thunderstorms), we figured to have an interesting day of checking out Fay's damage. Our first stop was Lake Trafford where we take our airboat ride. The lake had hit an all time low of 4 feet in June. By August 4th the level had risen slightly. Fay passed directly over the lake and dumped 12 inches on Tuesday, a few more yesterday and despite the "partly cloudy", dumped another 6 inches of rain today as one of the rain bands whipped back down south and provided a lengthy monsoon rain, soaking everyone on the airboat. There was no room on the boat, so I had to stay behind. When they returned, one little British girl was covered in mud but no one was sure how or why! It continued to rain all day and the lake level has come back to a near record high with 3 months left in the rainy season. I wanted excitement. I got it. Picture above is from July 11th. Below is from August 21st. Same dock. Vegetation is gone. The Everglades National Park was still shut down from the storm and Everglades City had been under a foot of water on Tuesday, but our walk in the Fakahatchee was productive with many alligator sightings and this happy little pup, glad that the rains have come back. 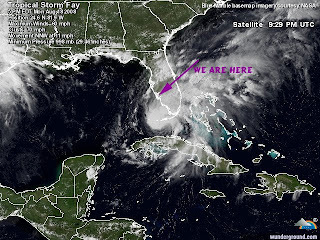 What does Star Wars: the Phantom Menace, Haley's Comet and Y2K all have in common with Tropical Storm Fay? They didn't live up to the hype. For varying reasons to be sure but for the storm that withered as it passed Fort Myers it was disappointing. I blame Jim Cantore. He's the guy on the weather channel standing in front of a pounding surf and telling people not to be complacent about a storm despite the fact that he's standing on the wind scoured beach dodging coconuts and sheet rock. When there's a storm on the way, the Weather Channel crews are out in force, assuring that Armageddon will be televised or at least a kitesurfers disastrous flight through the streets of Fort Lauderdale will be caught on video. So when Tropical Storm Fay failed to develop into a hurricane, came ashore at Marco Island 35 miles south and passed over Immokalee 20 miles east with 65 mile an hour winds on Tuesday 8/19th, it was disappointing to look out and see drizzle and a few shaking palms. It was as if Fort Myers was in a protective bubble and you would think that would be met with a collective sigh. Yet many hoped for more excitement from the storm. Why? It's not a New England nor'easter where you simply have to bundle up and shovel yourself out. Hurricanes can be catastrophic and they destroy homes, businesses and lives but the sense here was of great disappointment and in some cases annoyance that we had to stock up, prepare the home, batten down the hatches and all for what? A storm less dramatic than our usual afternoon thunderstorms. There is a general sense of monotony in our day to day lives that is livened by the possibility of something out of the ordinary. It gives us something to witness, experience and hopefully live to talk about. I hear it all the time down here as the after effects of Hurricanes Charley, Ivan and Jeanne in 2004 and Wilma in 2005 still resonate with those who survived them. They were destructive and in some cases debilitating for some, but it gives us a reference point on our individual timelines that is easy to pick out. Fay continues to smack Florida and has caused considerable damage after intensifying over land on Tuesday and is about to punch out into the Atlantic. We shouldn't be disappointed that we were spared the excitement. Others to our north will have hoped to have been spared after this storm withers and passes but no doubt they will remember Tropical Storm Fay. The Clam Before the Storm - Hurricane Fay? It smells like a monkey in here. It's getting dark outside. The rain has begun to fall and the wind is howling at only 10-15 mph. Tropical Storm Fay is expected to reach hurricane status in the next few hours and Fort Myers is expected at this time (5:40 pm Monday) to take a direct hit. We decided to return from Fort Lauderdale last night at 11 pm to make sure everything was secure at home and so we could evacuate with the cats if necessary. We stopped at the Wal-Mart in Miromar since that was all that was open and we needed a few last minute things. Miromar is north of Miami and apparently we arrived just after the looting occurred. The shelves were bare of hurricane supplies like water, food, propane....it was weird. When we arrived in Fort Myers at 2 am, two of the gas stations were out of gas. We filled up near the house and headed for bed, expecting a busy Monday. But its been quiet and remains quiet except for the occasional howl of the wind. We have our batteries, candles, cupcakes, water and everything else required to survive a storm for the next few days if need be. This thing may just blow by. But better to be stocked up. Hurricane Wilma knocked out power for weeks in some places. We could go live in Kenny's truck if we needed to. I think it's a certified fallout shelter. But for now we wait. I brought the cat carriers inside in case we need to evacuate them. In truth the carriers are former monkey "sky kennels" used to transport monkeys to my parents old Monkey Sanctuary. I forgot how much they still smell like monkey. Maybe I should leave them outside until the worst comes. The clam shell hasn't been completely closed yet. As a kid I always loved the board game Bermuda Triangle. The purpose was to move your four ships around the Caribbean and Atlantic, picking up cargo and avoiding the massive hurricane that randomly spun across the board. Now I feel like I'm part of the game and it was only a matter of time before a hurricane came my way. I've lived in Florida for 28 years of my life and never had a hurricane pass by. This one is making me nervous. MaLe and I are heading to Fort Lauderdale now for a wedding (Sunday 8/17), but may have to return Sunday night to retrieve cats or hunker down with them if things get sour. Maybe it'll go to Texas. 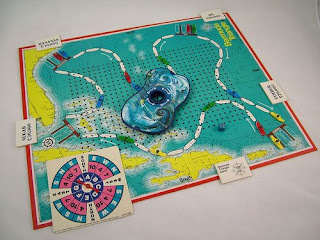 In the board game, if the hurricane spun over the top of you, it made a sickening "tink" sound when the magnet sucked up your ship. I'm thinking the noise will be a little different in real life and as far as I know magnets are not involved. It rained when MaLe and I arrived and rained all day Friday. Thanks to Mandy's magic, her gift to Sean was a spell to clear the sky for the 30 minute outdoor ceremony. It worked. The rain stopped and resumed shortly after heading inside. If you're going to do a best man toast, do it right. With the Bee Gees in the background and me with sassy pose (and one too many drinks in me), I gave my off the cuff speech which drew one audible gasp but thankfully ended with laughter and applause. I have no idea what I said. The bride made me wear pink. But the bride may have said something to the groom a bit later about the speech. There's no intended innuendo in this picture of the monument. I'm genuinely happy for Sean and April and I meant all the good stuff I said. I miss the old days, but wish you well on the new days ahead. Hopefully it won't be another 15 months till we see each other again. Got to spend a little time with Bill. Not enough time. He was nice enough to come get us in Bennington and travel with us east to visit Tara, Peyton and Carter. Is Peyton not the cutest? A trip to visit Tiffer and family is rarely without mischief. Why an 11-year old knows when to hold'em and when to fold'em is beyond me. He also knows when to run. This is how you rock out on Guitar Hero"
Jim cookin' the dogs and burgers for the brood. The whole nighttime caching crew. Aunt Mandy with baby Carter. Super Cheeks! And back home on JetBlue. Only 30 minutes late this trip. Miss the family already. Oh no - the cat got into the Cheetos?!? We're flying to Vermont in a few minutes but a few hours ago, my cat (General Tso) and I got into a Curious George type of nightmare. I was spray painting a box fluorescent orange. Once again - never mind what was in the box. Despite my best efforts to cover the porch floor and spray only the box, it was seem I missed. Obliviously - I left the box to dry, headed into my office, read a few emails and went back to check on the paint. As I crossed the living room floor I noticed ghostly orange orange footprints across the carpet! I looked out to the porch and apparently the orange mist had settled and I had tracked paint across the carpet. Idiot! So I'm scrubbing away and after seemingly getting most of the paint off the carpet I look out on the porch and General Tso is prancing in the paint! IDIOT! MaLe grabbed the cat who looked like he'd just run through a Cheetos factory. She dunked him in the tub, scrubbing the orange paint from his black paws. After donning my invisible hazmat suit I scrubbed down the porch and vowed to never paint anywhere near the home again. Grrrr. Let's hope the General stays out of trouble for the next 5 days while we're in Vermont and Massachusetts. 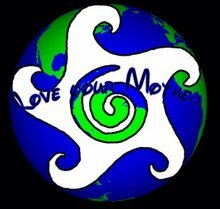 MaLe and I were listening to my favorite band, Roger Clyne and the Peacemakers on the iPod as we headed to see them at the Social in Orlando. Their song Love was playing and she said she didn't like it because of the line that says "Please take away my foolish bride". Who hasn't heard the wrong lyrics a time or two? It also makes for a nice segue into the proclamation of our wedding now 6 months past. It was a Wednesday and we had the day off. I think that was the case. If it wasn't don't tell my boss, but the plan had been to be married on January 23rd, 2008 and have a celebration in November with friends and family. Upon entering the County Clerks office we entered the queue and had to take a number. I debated between choosing the Maple Smoked Ham or the Mesquite Smoked Turkey but quickly remembered what we were there for. The Mexican couple with matching straw cowboy hats helped as well. The ceremony before the Justice of the Peace was nice enough and government workers stood and clapped after I was permitted to kiss the bride. The stuff of childhood dreams. We enjoyed lunch at the Veranda across the street. I recommend the fried grits smothered in a cajun red pepper sauce. If only for the adventure. Our honeymoon was a trip to Lover's Key State Park which was surprisingly dark and foggy for mid-afternoon in Florida. It gave it a serene and mystical, yet unicornless atmosphere. I served as photographer. It just felt weird to have someone else following us around with a camera. Like always. It was a beautiful day shared between the two of us. No fuchsia bridesmaid dresses. No honey-cream walnut wedding cake. No Electric Slide. Just us. As for the November ceremony? It would have been beautiful as planned but as we moved along in the process, the financial and mental toll it was taking after a few short weeks became exhausting. It would have been great to have her family from Ecuador and the US and my family from the US all together. But by not having that celebration - 3 days and 2 nights of festivities - we saved ourselves thousands of dollars on accommodations that can be spent starting out on this new life. We saved our guests thousands of dollars on flights, hotels and food and we saved the planet all of the resources that would have been spent getting people here, providing shelter for them and feeding them. So the ceremony is off and that is ok! Were already married anyway and I loved our wedding day! I was listening to the wife sing another song by Roger Clyne a while back. Without complaint she sang the chorus "Menuation.....menuation fall in love". I laughed and corrected the lyric and knew then we would have our first dance to that song at our imaginary ceremony.